congrats on having polished up the map to the finished article! 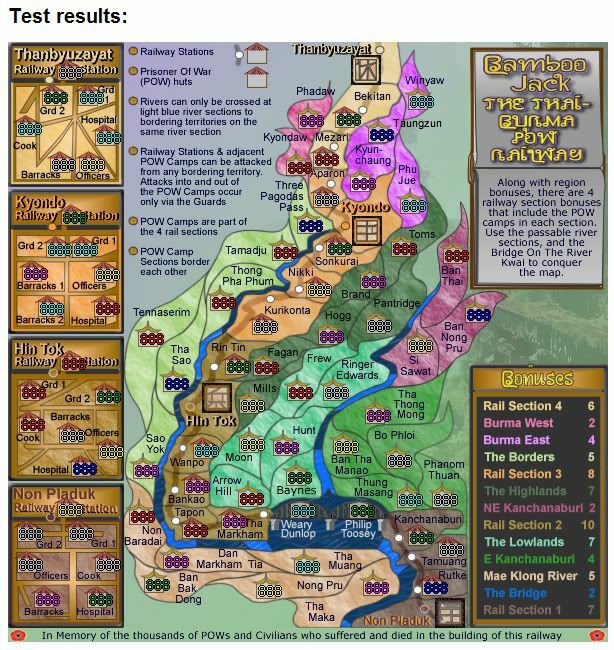 iancanton wrote: congrats on having polished up the map to the finished article! Thanks Ian, Glad you are pleased. Quench Time ! Great Job Cairns! RjBeals wrote: Quench Time ! Great Job Cairns! Thanks RjBeals...most sporting of you! 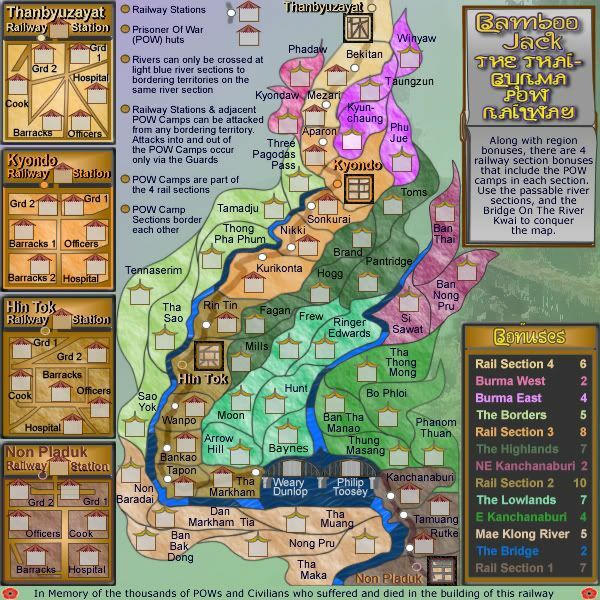 The Final Forge period has concluded for the Thai POW Railway Map. All objections have had their time. The Foundry and I hereby brand this map with the Foundry Brand. Let it be known that this map is now ready for live play (barring any Lack vetoes). Fantastic. This might be my favorite map yet (at least graphically). on'ya cairns, it's a goodin' !!! Gilligan wrote: Congrats for the...Uh...6th time! You can thank him for Bracket. He's beating me, I had to do something. *goes back to count his quenched maps* 4, Bracket would be 5. There's no hope. The party smilies are here anyway! Creepy Uncle Randy is sick, so he couldn't come. Gees Coleman....i thought you would have been up there also. Anyway thanks Everyone for your support. Actually Conquer Man makes 6 with my signature. I'm closer then I thought. I'll stop trying to hijack your congrats with a Coleman vs Cairnswk map count session though. Coleman wrote: Actually Conquer Man makes 6 with my signature. I'm closer then I thought. I'll stop trying to hijack your congrats with a Coleman vs Cairnswk map count session though. Be careful....i'm writing the xml for Madness....he he he he!!! Bamboo Jack's up for play...yay!!! cairnswk wrote: Bamboo Jack's up for play...yay!!! hey cairns - well done!!! Yet to play but looks good. Is there a reason though, that Kyun-chaung on the small map (to the north), has a white hut background? asl80 wrote: hey cairns - well done!!! Yet to play but looks good. thanks asl80....no, no reason, prob just a graphic error....i'll check it and update next version. There's something about this map that makes me want to stare at it for hours. My vote is this is the best map on CC to date. The way you enlarged the POW camps to the side is brilliant. And the color choices / bg patterns are perfect. You've outdone yourself Cairns. Well done my friend. My only question (and it's probably been answered in the thread) is what is that little blip on the bonuses border. 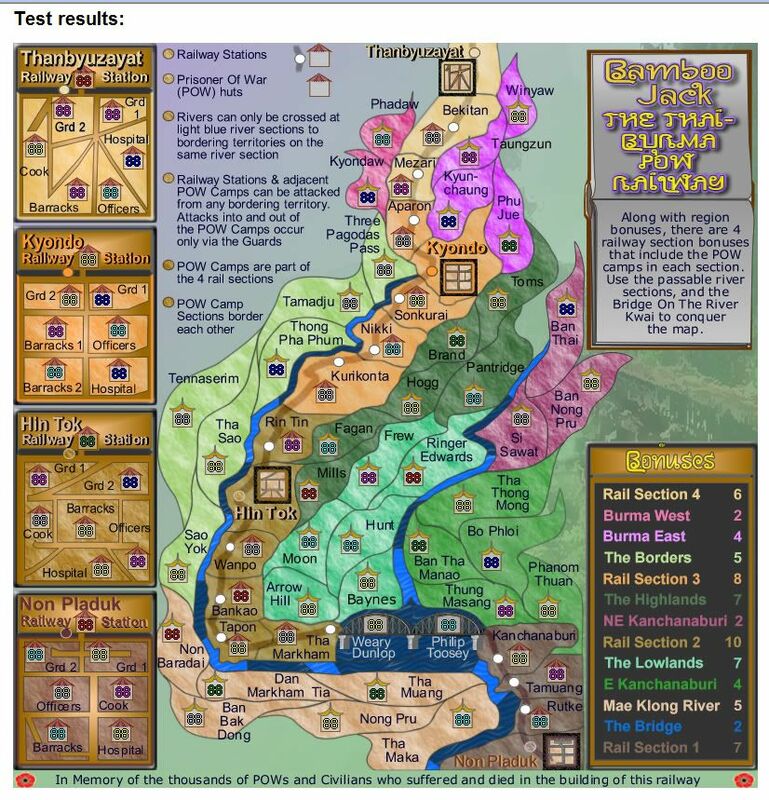 Above the word "BONUSES"
RjBeals wrote: There's something about this map that makes me want to stare at it for hours. My vote is this is the best map on CC to date. The way you enlarged the POW camps to the side is brilliant. And the color choices / bg patterns are perfect. You've outdone yourself Cairns. Well done my friend. RjBeals...this has been commented on a couple of times now...i mean the alluring design...and i agree, sometimes i quite starred at it wondering at the flames/flowers/patterns whatever...your thoughts are most appreciated. 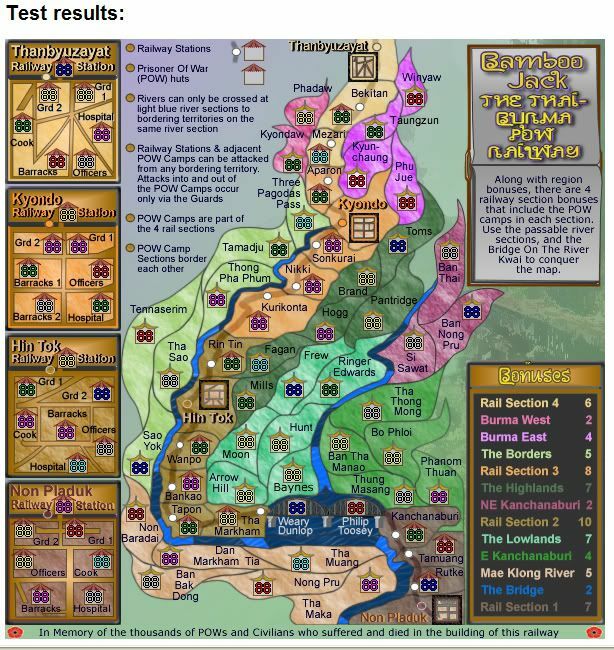 This is also largely due to the fact that the original dead bodies design was simply rejected, and i had to come up with something totally different, notable the Thai flavour, but i threw in the POW camps as an extra play additive. I still kept the Bridge on the River Kwai as part of the overall play theme. I am pleased. The little dots above the BONUSES are the way the font (a thai design) renders the N i think it is. Whooohooo! Thanks Warsteiner....glad to hear that somebody likes it....are you keeping it alive? yeh...thanks brandoncfi....sometimes my maps take a while to catch on....but thanks for dropping by with your feedback. Why does Hunt not connect with Si Sawat? Hunt borders Tha Thong Mong, so it is considered to be on the same river section as Si Sawat (as well as Ringer Edwards and Tha Thong Mong). I know this map has been out for years, but this seems like a fairly obvious error to me.